This is a collection of some recent scenics I shot for stock footage sales. I recently got the Tamron 70-200mm F2.8 IS lens. Its $1000 cheaper then Canon’s 70-200 and the quality is excellent! I’ve used both and I cant tell a difference in the video! 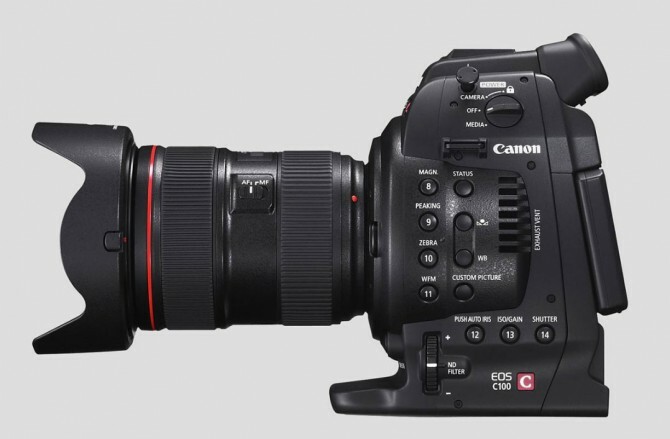 Plus…its black and looks like it’s a part of the camera better then the white model of Canons. That white can reflect more in glass when you are shooting and just looks….weird! Almost all the shots are with this new lens, with a few Tokina 11-16mm F.2.8 shots in there as well. Anyway, all this was shot on the C100 and recorded on a Atomos Ninja 2 at 24p. The overcranked shots of the water was shot at 60i (Shutter speed of 120) and retimed in FCPX 10.1. Nothing ground breaking here, just wanted to test the lens in the field and figured I’d make a little film instead of a “test clip” reel. I love shooting fall scenics in the Adirondacks of Upstate New York! This year was a great one for color. I was only able to get out a couple times, but when I did the light was fantastic. This was all shot with my Canon C100 and recorded to a NINJA 2 external recorder. I sell stock footage online at Shutterstock.com so having all the clips already in ProRes is worth the hassle of setting up the external recorder. It also helps give better image quality for very highly detailed shots or shots with lots of motion. These are the ones where the AVCHD codec runs out of bits. Specifics: Shot using a picture profile I cooked up that is a combination of some I found online and tweaked to my liking. Mostly based on the Wide DR setting. Color turned up some and adjusted for more red and contrast increased some, (black level and gamma adjustments). Further post color correction was done to get the most out of each shot. Lenses: Canon 24-105 F4, Tokina 11-16mm F2.8, and most shots were with my Tamron 18-270 super zoom! I love that lens and while it isnt as sharp as the Canon, it gets you an incredible range. It’s been several years since I picked up a new camera. My last one was the Canon 7D, a DSLR that shoots video. It was all the craze about 3 years ago. DSLRs gave nice soft, out of focus backgrounds, the cameras were small and the lenses were plentiful. Along with those benefits were many “problems” that you had to deal with. There was no audio on the camera, you had to record the sound separately for an interview and sync them up later in editing. Fine lines tended to “bead” or shimmer. A nasty artifact called aliasing. If you needed to shoot a brick building or a shingled roof from a distance, look out! My 7D served me well, but I’ve been looking for another option for a while. It seemed a new camera was being released every month if not sooner so I waited until I could find one to suit all my needs. 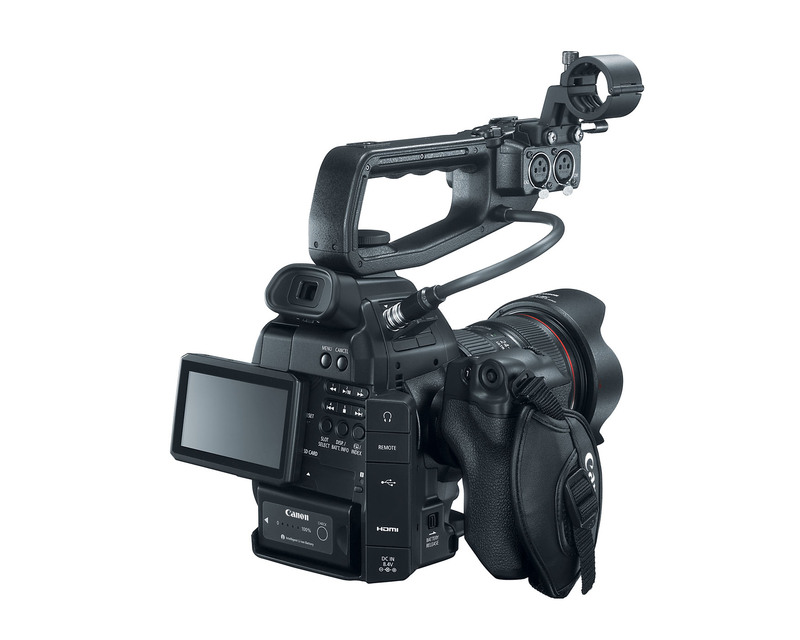 The Canon C100 came out late last year and it fit almost every category of what I was looking for. It doesn’t shoot 4k resolution, but that is far off before it becomes a standard and everything else is just right on! I’ve only had it a few days but so far it is the hands down the best camera I have owed. The low light shooting abilities is simply mind blowing. It can capture images in such low light that you can barely make things out to the naked eye. Not only capture them, as many cameras can get you an image, but this one does it without falling into major grain and noise. We went on a short camping trip this past weekend. It ended up raining for 3 straight days! But it did give me a chance to try out the camera and all it’s settings. I posted the clips in a short video below. Notice all the interior shots were done with available light! And the inside of that cabin was very dark. I’m still learning about the settings but this footage is very promising and I especially love how tack sharp it is when you want it to be. A collection of Winter clips I’ve taken with the DJI Phantom Quadcopter and GoPro Hero 3 Black edition camera since I received it 2 months ago. It takes some effort to get footage this smooth but it IS possible! Start with balancing the props! Many videos online about how to do it and it makes a HUGE difference. I picked up an isolation mount for under the copter, this keeps alot of the vibration from reaching the camera. Then I got an ND filter holder and ND filter for the Hero, this removes the last bit of jello in the footage! Finally, I post stabilize each clip in Final Cut Pro X. Since I shot the footage in 1080 60p, I conform it in the timeline to slow it down to 50% speed, but because it was shot at 60 fps, it looks silky smooth! So not quick, but this will get you the results shown below! I have relatives who live about 20 miles from Newtown, CT. They have three children who are in elementary school, and when I heard there was shooting in CT at a school my heart stopped. While I was glad they were OK I’m still sick to my stomach, as is most of America, at what happened. I started putting this together a few days later. It’s dedicated to all those we lost in Newtown, CT on December 14th, 2012. This video uses a haunting song written by Hans Zimmer called “Aurora” that he created for the victims of the shooting at a movie theater in Colorado this past summer. It’s all about the light! Photography and videography are, by their very nature, dependent on light hitting the sensor of the camera. That light can be soft and muted or bold and vibrant. I found both kinds while out shooting this years autumn colors in Northern New York. It was a spectacular year (2012), with many bold reds mixed in among the yellow and orange hues. Most of these clips are again from the Adirondack Mountain region of far upstate New York. While I think you can’t beat bright blue skies and sunshine for the best Autumn shooting, I did go out on some misty, rainy days and found the light to be quite spectacular as well, but just in a different sort of way. I’ve included both in this video, which features the music of Tim McMorris (“Translation”). His work can be found on AudioJungle.net. I just recently learned of this site and find the licensing fees to be priced right and plan to use more from there in the near future. FInally I used the Canon 7D and my Sony XDCAM EX1 for the cameras, and my cobracrane jib and Konova slider for the moves. How to shoot from a boat! This is a short video that shows how I shoot video from a boat including some sample shots! I like a flat bottom boat for minimal clearance under it (you can go to REAL shallow water), and also for setting a full size tripod on it, being able to smoothly pan is a big plus. I also shoot from a canoe but a flat bottom “John” boat works better as it’s less tippy. Use an electric motor driven off a deep cycle marine battery, this will add minimal vibration to the boat. Setting the bubble (keeping horizon straight) for the tripod is important and tricky as a slight shift in your body will change the horizontal level in the boat. You need to put your one arm back on the motor like you are running it, then adjust the bubble of the tripod to keep it level when you are shooting. If your arm isn’t back like you are steering it, then the level will be off when you DO move your arm back! Pick a very calm day (no wind or waves) and use an external monitor.